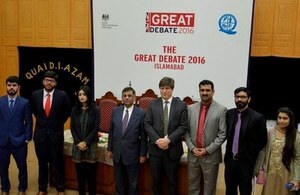 Islamabad: The last semi-final of the British High Commission’s fourth annual GREAT Debate competition was held at the FAST National University in Islamabad Tuesday. The competition featured 65 students from 19 universities in Islamabad and Rawalpindi and was attended by senior members of academia and officials from the British High Commission. At the end of an intense competition, Lajpaal Ali from FAST National University was the winner and Hamna Amir Aziz from NUST was the runner-up. The GREAT Debate competition is taking place from December 2018 to February 2019 in five cities across Pakistan. The Counsellor and Director of Corporate Services at the British High Commission Peter Abbott said: “We are honoured to see the best debaters from Islamabad and Rawalpindi take part in our GREAT Debate competition. Over the past five semi-finals, we have engaged over 120 debaters across Pakistan and I am looking forward to a strong competition in the grand final. “The UK and Pakistan have a strong relationship in education, culture, sports, infrastructure and trade. The UK is Pakistan’s second largest export market overseas and its second largest source of foreign direct investment. That relationship has been reflected in the themes for the GREAT Debate which include trade, entrepreneurship and innovation and it is these areas that can lead Pakistan to a bright and prosperous future.” The GREAT Debate is a debating competition for university students. There have been five semi-finals – in five different cities (Islamabad, Lahore, Karachi, Peshawar and Quetta) involving students from over a 100 leading universities across Pakistan – and the winner and runner-up of each semi-final will compete in the final in Islamabad. Winners and runner-ups from the semi-finals will be given one year British Council digital library memberships. The winner and runner-up of the overall competition will receive a scholarship reward to contribute towards their tuition fees.